When I drove down the road this morning I couldn’t help but notice Naked Ladies were out. 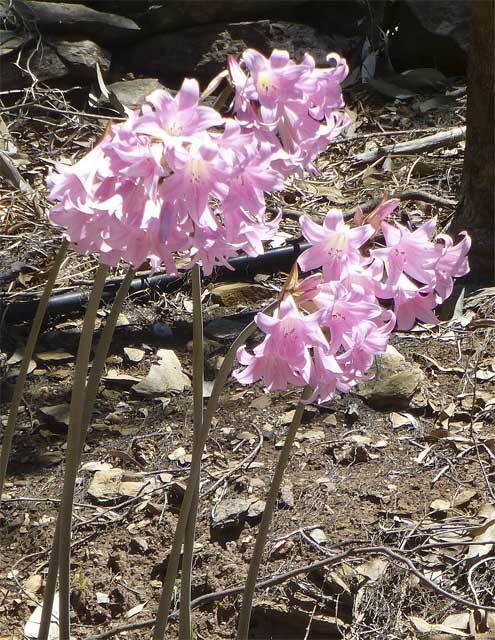 Now before some of you get too excited I’ll point out that Naked Ladies are the Belladonna lily (Amaryllis belladonna). The reason I was surprised to see them is that they are also called, “Easter Lillies” and it’s still January. To me it seems very early for them but I don’t have any growing in my garden so I can’t be sure they don’t always flower at this time. Maybe someone who does have them in their garden can tell me if they really are an indication of a strange season. I’ve been to possibly 20 different countries and up through Central Australia maybe 6 times but last year was the first time I made it to Tasmania. When I was a teenager I never thought that would happen. My first year of College I was delighted to discover there was a Travel Cub, each year a trip was organised to somewhere in Australia and the rates were good. I joined the club and we had a great trip through the Snowies to Canberra, Sydney and Brisbane. I’m not sure I’d relish a bus, whoops coach, trip like that these days but it was fun then. The following year somehow I managed to become responsible for organising the annual trip. Tasmania was the favoured place. I hand balled the job to Mum, she loved talking to people on the phone and organizing things! The Art lecturer, John Bell, had previously organised trips to Central Australia and he was doing it again that year so two trips were happening. I thought about it and decided I’d go on the Central Australia one because I was absolutely sure I’d never tackle such a trip when I was older. Tasmania would be fine at any age. The Tasmanian group stayed in Motels etc but the Central Australian group travelled by coach with a support, “Grub Truck”. We slept in tents most nights although I do remember sleeping out under the stars at least once. That was the night after we went through Coober Pedy. Why would I remember that after almost 50 years? Because I bought some lovely dried apricots in Coober Pedy and really enjoyed them BUT that night I had an urgent call. It meant getting out of my sleeping bag fast, in darkness, trying not to trip over any of the cocooned bodies lying about on the ground as I raced to find a “secluded spot”. In 1965 there was no acknowledgment of Aboriginal land rights or even place names. We camped at “Ayer’s Rock” and climbed to the top to admire the views then visited “The Olgas”, I decided not to join the climbers instead I stayed at camp and helped the cook. After Ayer’s Rock we went on to “Kings Canyon” travelling through Ernabella Mission lands. People intercepted the coach and told us we had no right to be there, somehow we had “strayed” from the right road. At Kings Canyon we walked all the way to the end of the canyon, some of us swimming and gasping in the freezing cold pool before climbing up to the cave in the end wall. I’ve been back to all those places again but now I know the Aboriginal names, Uluru, Kata Tjuta and Watarrka and I respect the spiritual significance of the places to the Aboriginal owners. I don’t clamber over their sacred grounds anymore. How average Australian college students looked in 1964 -maybe the one in shorts is skewing the average a bit. The best way to come down Uluru before the chains were put in which was before people were requested not to climb the sacred rock. When I think of steam trains I think of ladies wearing long dresses and holding parasols, boys in knickerbockers, men wearing suits, ties and Fedora hats. No way do I think I belong, “in the picture” but I remember Steam Trains. Mum and Dad owned some shops and flats at Henley Beach, just next to the Ramsgate Hotel and I’d often go and keep Dad company when he was doing maintenance there. The property was built on a sand dune, the shops fronted onto Seaview Road with the flats above and behind, the dune sloped down to Military Road at the back. I remember being on the sand dune which was planted with Pigface, looking down to a scooped out section where Dad parked his car and across the road to the station. Trains would come in from Grange, drop off the passengers then slowly continue along to the water tank. They’d fill up then come back because Henley Beach was the end of the line. When I think about it now I can’t imagine how the engine got to be at the front again, there certainly wasn’t a big turning loop. In 1957 the station was closed and the terminus was at Grange. Now, at Henley, there is a Police Station instead of a railway station and a big block of flats where the water tank was. Every Christmas holidays I used to go and stay with Aunty Mavis in Port Pirie. Once Jayne and I both went in a plane but every other time it was by train. It’s amazing to me now that I went alone when I wasn’t even a teenager but someone put me on the train at Adeaide Railway Station and Aunty Mavis met me in Pirie. The train stopped at Bowmans Station so people could go and buy snacks and drinks. There was always a crush of people at the counter and I was frightened that if I got off the train it would leave without me. 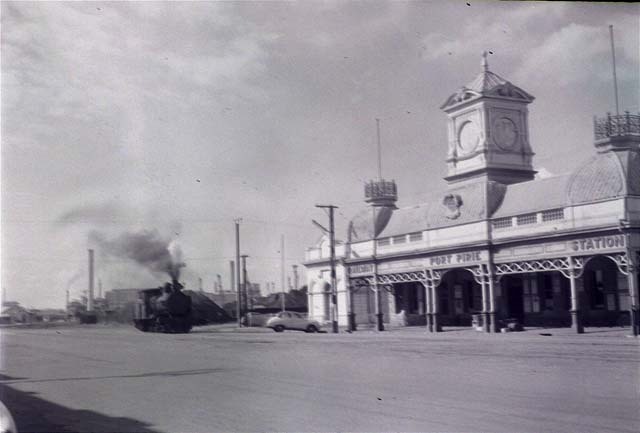 The steam train went right down the middle of the main street in Port Pirie. This gorgeous little Rose starts off yellow tinged with red and seems to change daily until it reaches a dark pink. I went to school Primary School in the 1950s, the days before trendy backpacks. Girls carried little cases and young boys had little leather backpacks but nothing like the modern ones. Older boys, if they were lucky had kitbags. I think maybe kitbags and long pants went together! Inside the cases and bags there were no flash drink bottles, insulated lunch boxes, MP3 players, mobile phones or “tablets” even if they belonged to big Year 7 kids. Things you might have found in a case or bag were some doogs (marbles), skipping rope, piece of string to play “Cat’s Cradle” or a ball. There would probably have been a reader, maybe a homework book and most kids would have had lunch in a paper bag. I can’t remember ever taking my lunch, Mum always gave me money to buy it from the little shop beside the school. The little shop sold all traditional lunches, pies, pasties, sausage rolls and I guess sandwiches. In my last couple of years at Primary School they introduced Hotdogs and they were very popular. Coke must also have been available because I remember a particular incident concerning Coke. When we were thirsty we used to go to the taps at the troughs and drink the water from our cupped hands. Nobody wandered about with little Fruit Boxes or pop top bottles of drink. One day our teacher must have felt an overwhelming need for a Coke because she sent me to the little shop to get it for her. On the way back the urge to taste it was just too great. Everyone else was in class so I took a sip through the straw then realized it would be lower than she expected so I topped it up at the water trough. She drank her Coke and said nothing but I was never asked to get her a Coke again. During the late 1970s and early 1980s there was a TV programme called, “Not The 9 o’clock News”, it was a comedy sketch programme. I don’t want to plagiarise the show but I do want to bring in, “Not the 6 o’clock News”. When I was a child I wasn’t interested in reading the paper or listening to the radio to find out what was happening in the wider world, that was for the adults to deal with. One afternoon coming home from school in a crowded bus a newspaper advertising poster with the headline “WORLD WAR 3 IMMINENT” certainly grabbed my attention though. I believed it 100% and was terrified, it had to be true, it was in the newspaper! Happily it didn’t eventuate. When I was a teenager TV came to our area and it took over news broadcasting for most people. As technology and communications have improved I’ve seen things from all over the world often happening in real time. Broadcasters choose to report the most dramatic happenings and usually fit them all into a 30 min time slot. What this means for me is a barrage of wars, murders, robberies, flesh eating diseases, catastrophic cyclones, earthquakes, bushfires, droughts or floods causing misery all over the world. Then the ads come on for charities which use this prime time to beg me to PLEASE HELP. The overwhelmingly sad thing is, if I give my last cent it won’t stop the misery and it won’t stop the ad coming on to plead for more. What’s the solution? For me, since I can’t watch, “Not the 6 o’clock News”, I’m choosing not to watch any News, I look on my computer and choose the articles I want to read. I do have a big concern though, about the impact this type of reporting might be having on children. There were terrible things going on in the world when I grew up but I was happily ignorant. I learnt to deal with issues in my little world, a brother who hated me and punched me each time we passed. Tough? Not when compared with a sniper taking potshots at you if you dare peek out your door! Being fed quinces and rice. Yuck? An absolute banquet if there’s no food in your Refugee Village but I didn’t even know those things existed. How do today’s kids cope when it’s in their faces day in and day out? We don’t want to create a society of people who simply don’t care what happens to others but nor do we want a society of people who are so overwhelmed by world misery that they sink into despair. Maybe someone will produce, “Not the 6 o’clock News”, it will have interesting, varied segments and every day it will end on a positive note. We were away for 2 weeks in November and despite some very hot weather these plants showed no sign of stress when we returned. I wasn’t happy with these wicking boxes, I’ve found bigger, more substantial boxes that are used to transport fish. 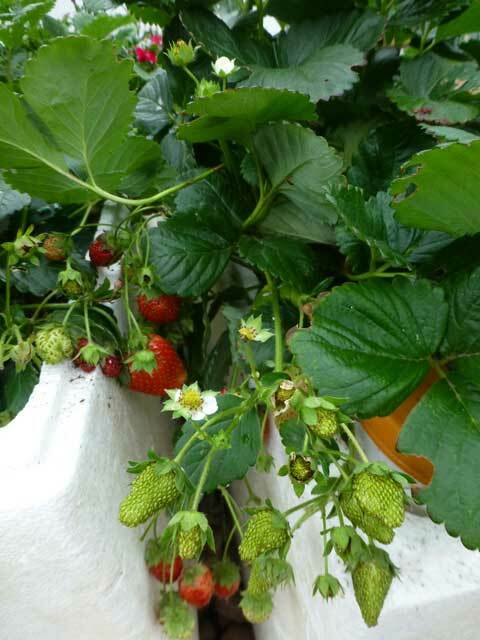 I decided I’d empty them out when the strawberries died off but they are just getting more and more prolific. I’ve had all different sized fruit but they’ve all been very, very tasty. They might not be pretty but my wicking boxes are the best containers in the garden.